Ask fellow campers about "Lynchburg Wilderness RV Park " and nearby attractions. We contacted the owner once before we began our trip but were unable to reach him while traveling to the park or upon arrival. We walked the site before attempting to drive through the covered bridge or up the steep, loose gravel driveway. We decided to drive on to a state park rather than stay in such an ill-kept, vacant, poorly mowed "park". We camped at Lynchburg Wilderness RV Park in a Travel Trailer. We stayed because it was our only option for Lynchburg except we later noticed a city park that allows RV's which would have been just as good. It was very hard to get hold of the site management, and the place is in disarray. There is moving equipment everywhere. It was OK for overnight, but there is zero shade. The owner said he had too many irons in the fire to take care of the park. We had to hunt him down to pay him. Would stay in the city park next time. We camped at Lynchburg Wilderness RV Park in a Motorhome. We stayed here one night traveling through. Easy access to campground. All sites have full service, 50 amps, water and sewer at all sites. Would stay here again when traveling. I only rated it a 7 because it would not be a good, long stay location for us. Overnight it was great. We camped at Lynchburg Wilderness RV Park in a Travel Trailer. Unless you are desperate….I would keep driving. The reason we originally selected this park was because it was the only one I could find in the area. We pulled in and selected a site, but never saw any personnel. The campground was a deserted, hilly, un-level rocky field of weeds. The actual site was reasonably level, but the utilities were terribly positioned at the very back of the pad. I had to use my extension for my electric and would have had to use my extensions for sewer and water had we planned to use full hook-ups. We were only staying for the night so we planned to use the campground restrooms instead of hooking up. When my wife and kids went to check out the restrooms, they returned and said hook it back up, we are not staying here. The rest rooms were hot, muggy and dirty, and there were bugs all over the place. We hooked up and departed. I would not recommend this park and will not return. 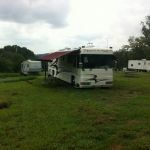 We camped at Lynchburg Wilderness RV Park in a Fifth Wheel. Are you affiliated with Lynchburg Wilderness RV Park ?